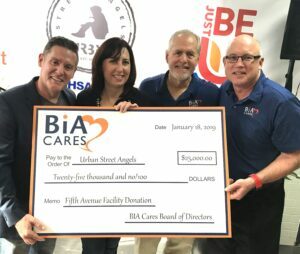 At its recent Grand Opening, BIA Cares proudly presented $25,000 to Urban Street Angels. Founded in 2012 by Eric Lovett, Executive Director, the organization is one of Southern California’s leaders in the fight to end youth homelessness, both in the San Diego area and beyond. Urban Street Angels provides a supportive housing program for San Diego’s transitional-age homeless youth, defined as 18-25 years old. Their goal is to divert these youth into a positive life path so that they never become chronically homeless. Additionally the organization launched a social enterprise, 8 West, to provide a sustainable jobs program for homeless youth seeking to leave the streets behind for good and in 2016, the supportive housing program’s footprint expanded by forging a critical partnership with the County of San Diego. Currently, up to 35 homeless youth call the Urban Street Angels supportive housing programs “home,” and over 20 youth have apprenticed with the 8 West social enterprise. “Our mission is to end youth homelessness by providing emergency overnight shelter, supportive housing and job training opportunities to cultivate personal responsibility,” stated Lovett. BIA Cares is proud to provide funding to Urban Street Angels to support the construction of their ever expanding housing program to help end transitional-age youth homelessness. Join BIA Cares in supporting the efforts of Urban Street Angels.